Coconut water is one of my favourite healing Superfoods because it is so tasty, refreshing and hydrating and is loaded with health benefits. I instantly feel like I’m holidaying on a tropical island paradise when I take a sip. Coconut Water is the juice in the interior of a young coconut. It is the purest liquid second to clean water –is anti-viral and anti-bacterial. In fact, Coconut water is almost identical to blood plasma. In cases of emergency coconut water has been used as an intravenous hydration fluid instead of the standard IV fluid. It’s loaded with B complex vitamins (riboflavin, niacin, thiamine, pyridoxine & folates), calcium, iron, manganese, magnesium & zinc, potassium, enzymes, amino acids, and phyto-hormones. Coconut Water is low in calories and free of fat and cholesterol. It is renowned for its ability to re-energise and hydrate the body as well as assists in weight loss. For these reasons it has been marketed as a sports drink. Coconut water also aids in metabolism and has an alkalising effect on the body to assist a healthy environment and keep disease at bay. 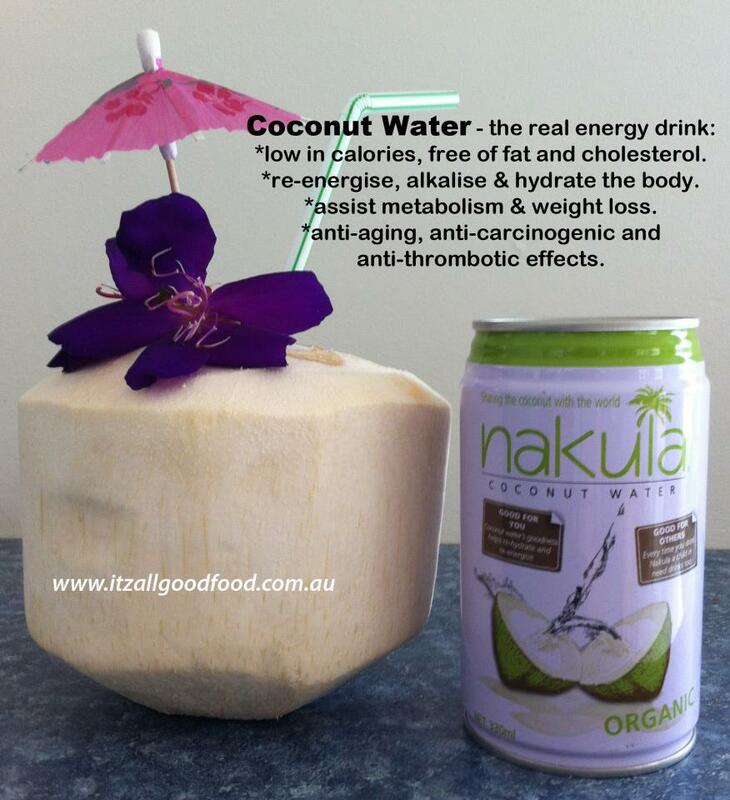 Studies have also shown coconut water has anti-aging, anti-carcinogenic and anti-thrombotic effects. Use as a healthy alternative to artificial drinks, sport, energy and mixer drinks. Your whole family will benefit from it. This entry was posted in Coconut. Bookmark the permalink.